Starting April 15th, return to our Sunday afternoon series class schedule. Rob & Dawn (with Anna filling in) will be back to teaching group classes! 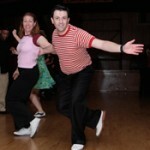 The first classes of 2012 will be the six count Swing Dance series and the Charleston class. Both are perfect for beginners! The swing dance class with start from scratch and teach you all the essentials of swing. You not only learn the basics, but a whole host of moves to add to your library. The goal is to get you comfortable and confident on the dance floor by teaching you how the dance works as opposed to memorizing steps. The Charleston class will also start from scratch and teach you both 20’s style and 30’s style charleston. It will show you how to dance Charleston as a dance itself and how to integrate it into your swing (no matter the style). From flapper style to side-by-side to tandem; this class has lots of cool stuff! Series classes are a great way to learn! This format will take you step-by-step, week-by-week to avoid information overload. Not only do you get an hour of class time a week, but each class is followed by a half hour of practice time where you can ask questions and get individual help. We work to give you as many tools as possible to make your dance education a success! It’s a girl! Flyin’ Footwork has a new member of the team! Please welcome to the world Reagan Grace Shrewsbury! Born February 16th at 5:02pm. She is 7lbs 7oz and is 21 inches long. Mom, dad, and daughter are all doing well, but very exhausted. We’ll be taking a break for a little while, but will start planning classes again soon. In the meantime, you can follow her adventures and view more photos by clicking here. Happy Valentine’s Day! We’ve been getting lots of people asking two questions. 1) “Has the baby arrived yet?” and 2) “When do the spring classes start?”. So I thought I’d take a moment to answer those. As for the first… nope, the little one has not arrived yet. He/she seems to taking their dear sweet time. And that is fine, we’re still well within the normal window. Trust us, we’ll keep you updated on the big announcement. As for when the spring classes start, unfortunately, we can’t answer that until we ourselves get an answer to the first question. Once the new arrival is here, we’ll start planning our spring schedule. In the meantime, you can either sign up for the email list (on the right) or send us a brief note and we’ll email you once the schedule is set. Thanks, and we hope to post another update soon! Group Classes: Normally, we start classes for the year in early January. However, we will beÂ postponingÂ our first classes of 2012 until sometime in April. Shortly after the baby is born we will have a better idea of the exactÂ time frame and will beÂ schedulingÂ classes then. To stay up to date, please sign up for the email list (on the right) to get the latest updates on when classes are announced. 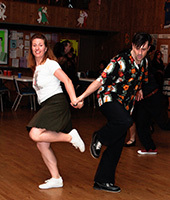 If you are just starting out dancing, we highly recommend going to the beginner swing dance lesson before the 2nd & 4th Saturday dances. That will give you a great head start! Private Lessons: As of mid-January, we will be putting private lessons on hold for a while. We plan to return to group classes first and private lessons sometime after that. Again, keep an eye on the website and the email list for updates. Thank you to everyone for your understanding and support! We’re very honored that we’ve already gotten many inquiries on when we will be returning to teaching. With the help of some close friends, we plan to return in spring. If you want to be one of the first to know when the little one arrives, be sure to follow us on Facebook. Christmas Swing Gala (12/10): Don’t miss out on Orlando’sÂ premierÂ Holiday swing dance event! This event features live music by the “New Traditions Jazz Ensemble” big band. Never danced before? No problem! The night kicks off with a beginner swing dance lesson. Click here for more info. 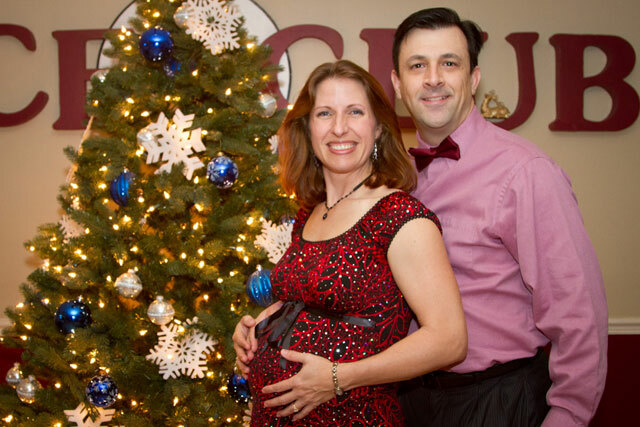 Rob & Dawn’s Christmas Party (12/17): We would like to invite all our friends, neighbors, and students (past and present) to our annual Christmas Party to say thank you for a great year! We’ll provide the music and the dance floor. Please feel free to bring light snacks and/or drinks (no alcohol please) for yourself or to share. 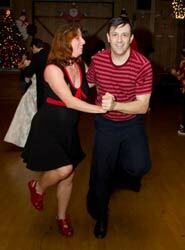 There will be an open dance floor and we’ll be playing lots of great holiday swing music. Feel free to dance, or just come out and socialize! The event will be on Saturday, December 17th from 8pm to 11pm at the Longwood Ballroom.